One of the primary messages out of public health agencies and nutrition gurus from Walter Willett to Michael Pollan is to eat more plants. And, indeed, in many studies, vegetarian* diets are associated with better cardiovascular health, lower BMI, and better health behaviors (less likely to smoke, drink, and participate in shady Rock and Roll activities). *In most of these studies, vegetarian does not mean vegan, but usually includes the addition of dairy and eggs, and in some cases, also fish and chicken. Many of these studies use the metric of what people self-identify as, rather than what people actually eat. And the large ones are cross-sectional observational studies, which don't give us causation. Studies have mostly (but not always) shown that vegetarian diets are associated with poorer mental health, particularly when it comes to anxiety, eating disorders, and depression (See You're A Vegetarian. Have You Lost Your Mind?). This correlation makes sense due to the particular nutrients mostly vegetarian diets are low in (B12, long chain omega 3s, choline, and zinc among others) are particularly important to the brain and nervous system. Mediterranean diets, on the other hand, rich in fruits, vegetables, and whole grains, but also in fish and poultry, are associated with better mental health, and a randomized trial of men with type II diabetes assigned to a Mediterranean diet for several years had lower incidence of depression than controls (1). I tweeted the paper yesterday, proving that there's nothing a paleo-leaning audience loves more than a study inconsistent with the notion that vegetarian diets are the elixir of eternal health and happiness, at least for humans. I'm happy to let each of you in the twitterverse determine how misleading I am. It would be too cumbersome to define each verb each and every time I use them in 140 characters. Let me qualify that I'm sure there are happy and healthy vegetarians out there, and all my best to continued health and happiness; be sure to get your B12 from somewhere! Anyway, the researchers did a decent job of getting a nice cross section of people in Austria from all levels of health and socioeconomic classes. Then they pulled out all 343 "vegetarians" (which were vegans, lacto-ovo vegetarians, and lacto-ovo-pescatarians) and matched them with folks from three other self-identified groups that we shall call the virtuous carnivores (lots of fruits and veggies + meat), the carnivores who eat less meat, and the shameless meat-eaters. Then the researchers measured (or asked about) a lot of health factors using trained interviewers. Body mass index, smoking, alcohol use, how many times a person visited the doctor, whether they got their preventative health care, and what sort of medical conditions and health complains they had. After a lot of number-crunching, the results were as follows: Self-identified vegetarians had poorer mental health (defined as depression and anxiety), poorer overall health, and poorer quality of life. The other finding was that BMI correlated linearly with the consumption of animal fat (with the shameless carnivores having the highest BMI, the vegetarians the lowest). What can we learn from this study? Are vegetarians are more likely to be neurotic sick people looking for dietary cures for what ails them, thus come out of the study looking more skinny, unhappy, and unsatisfied? Or are vegetarian diets nutritionally bereft leading to health problems, mental health problems in particular? We will never be able to get that answer from a study of this design. The Mediterranean diet, as always, has more consistent data for positive benefits for mental and physical health. I tend to think that the diet with a bit of variety and the least processed food will be the healthiest and simplest to explain. Even if we had incontrovertible proof that vegetarian diets are the healthiest, no more than one in 10 folks would actually switch to them. I'm sorry but I just read that abstract and it does not state whatsoever that the animal diet intervention was "detrimental" to gut microbiome. The conclusion was simply that the gut was able to adapt quickly to a drastic diet intervention. These days "eats lots of meat" probably includes a few people doing this for health reasons. 24.9 is the upper limit of the "normal" BMI range (and probably a healthier BMI than 18.5, the lower limit). Eating lots of protein, more of that BMI is likely to be muscle too. This sounds like an interesting result relevant to the topic of Evolutionary Psychiatry: Autoimmune attack behind some cases of schizophrenia. I eat vegan plus seafood. I think that is a very good diet. LOL... Dr. J that would NOT be a Vegan, or vegetarian diet. it's interesting that the term "vegetarian" keeps encompassing the concept of eating a wider number of animals. what in the world is up with that? Please don't write off this comment right away. For some reason, many people decide up front that issues that follow are inane. I appreciate your toward-the-end comment about what this study cannot tell us. I would add the issue of compassion. In the case of factory farming, our way of doing unto others of other species must make an intelligent, compassionate person sad. It's also easy to imagine someone more easily able to afford lentils, etc. than free range, grass fed, etc. Perhaps there's a difference in the mental constitution of people of modest means who choose to keep in mind the facts of factory farming. This is a choice of sorts, at least the way I live, with food production out of sight and suprisingly easy to ignore for many. It's easy to imagine that a person who makes a minority decision to choose against such direct cruelty might be predisposed to other things. And I completely agree that someone making such a choice would be best off with access to B12, vegetarian omega-3 sources, etc. I'm guessing that most people will write off this comment as inane. Yet surely many people can relate to some of these things. Many people have creatures, not of their species, who they care for very much, e.g. pet dogs or cats. Many would not choose cruelty toward these sorts of animals. Life and Nature are not kind to its creatures (look how many hatchlings are eaten right away), it is how the life is, and people are here the way we are because we were evolving through a merciless natural selection. We are part of a natural eating circle where creatures eat each other , and we are on the top of that pyramid. May be the individuals who could be seriously upset about how the life on Earth is arranged are more mentally fragile. Look at our ancestors, at the things they had to endure.We are supposed to be able to survive without reaching a breaking point wars ,very hard work, death of loved ones, disappearance of all possessions , be prepared to see only few children survive out of many, be able to fight hard for a better survival environment. If the thoughts about animals dying to be a food is enough for some individuals to choose a way to eat which puts them and their families at a disadvantage, they are not a resilient type. Most of us are happy and enjoy life despite a hard fact that we all will be dead some day. I think the ability to brash away the thoughts which can unreasonably disturb is the important part of one's mental health. Thank you so much for your thoughtful reply! I can't tell you how much I appreciate it, and I agree with a great deal of it. I do devote resources I'm lucky to have to provide my family a diet which I think is pretty well chosen regarding my family's health. I think almost everyone would agree that what constitutes a "pretty well chosen for health" diet could be endlessly debated, that science evolves, and that there's an enormous amount that nobody knows. Of course, people (including those who agree on a lot) take their myriad paths through the decisions in the big events and in the minutiae of everyday life. It seems like the events of a life like Temple Grandin's touch on the issues at the heart of this blog in multiple ways. Of course, I absolutely defer to Emily Deans on this one. Temple Grandin said, "Nature is cruel, but we don't have to be." I think nature is cruel, but we don't have to be as cruel as nature allows us to be, and cruelty should matter in decision making. If I try to live by this, I have a myriad of paths to take, and shades of gray are everywhere. Still, in life in general, I think it's worth looking out for slippery slopes, because they can lead to terrible things. Like almost all people, I love my family more than anything in the world. I love people the most. Crimes against humanity break my heart the most. Regarding vegan people, some are undoubtedly neurotic, but I think compassion is an important part of the big picture. As far as "health of our fellow man and woman" (public health?) goes, the complexity just awes me. It's way beyond my wisdom. I have no clue how it can all work. Suppose a person somehow knew that an optimal diet would be vegan-like. Right now, huge numbers of people would understandably eat strawberries that have seen tons of spraying and tons of truck travel, a far cry from the berries of our ancestors. Suppose a person knew that the best bet diet would be hunter-gatherer-like. Right now, huge numbers of real world people would eat the typical modern broiler chicken, a far cry from the birds eaten by our ancestors. Thank you so much again for your thoughtful response! I also want to add that I experienced life during the time of food shortages, and it made me value animal foods a lot and appreciate its availability and affordability now. I see modern agriculture as the way to provide maximum food at the most affordable price for all people, regardless to their income. It is the way to fight hunger and malnutrition, it is the progress in human life. People benefited from it, and individual attempts to ignore the existence of modern food production will not take it from the modern way of life. Fortunately, at the moment I can afford to buy mostly higher quality food (80% of what I buy) , but if I were very short in money, I would most probably limit myself and my family with highest quality eggs and butter, and get only chip organ meats from grass-fed animals. I absolutely don't think about my carnivorous choices as a cruelty. I just use what is available. I meant to say "maybe" vegetarian omega-3 sources, as I think it's unclear right now. Sorry, again, for the lack of proofreading! The amount of a substance in a diet and what goes on in the body can (of course) be a complicated and sometimes not intuitve relationship. One example would be what happens with synthesis and processing of carnitine in vegans. I would add that not only vegetarians should pay attention to their B12, but so should omnivores. Even if you eat multiple servings of meat/poultry/fish per week, you can still have low B12. >400pmol/l is a decent B12 level. Vegetarians also lack the full set of amino acids that are found in meat products. Being a vegetarian is a noble way of life. However, if we want to be so compassionate about life, why don't we stop eating plants too??? That's not what I'm advocating but it's hypocritical to be against eating animals and still eat plants. Overall, people should choose a diet that is best for them. Your DNA and your biochemistry should be the judge of that decision, not a block of thoughts. As a 10year+ vegan, I can attest that mental health is a problem for many. Just youtube around for vegan videos, particularly 80-10-10 people who are doing low fat vegan thing... they're clearly not well, mentally. Unfortunately most veg/vegan/raw people have embraced 1980's low fat/heart-healthy carbs ideals which is really a horrible way to eat. I know a ton of vegan who are super healthy all around, but they're in the very unpopular high fat camp which is still a long ways off from mainstream acceptance. Food becomes religion, I think we all need to step back and look at things more rationally. Completely disagree. Just based on anecdotal evidence from myself and the people I have known that have gone vegan. I (and those others) all report feeling a LOT healthier and happier about life in general, and the choice to not partake in eating the flesh or products of other creatures specifically. I feel that the clear and accountable link between my ethics and my morals makes me so much happier than I was when it ate meat! Unfortunately, your experience is anecdotal as you note which largely says nothing about the larger group of people. I'm glad you're happy, but if dietary decisions run the risk of causing harm then people need to look really carefully at them. I'd tell the same thing to someone who tells me they eat steak all the time and have no heart health issues. Someday someone will bring up the criminal brainwashing by militant vegans on vulnerable young teens. Easy to recruit youngsters who are looking for ways to assert themselves within the family dynamic. A new vegan habit, while being on the verge of an adolescent growth spurt, is a recipe for trouble. It's not about whether or not you eat meat and/or greens, it's about the quality of said nutrition. If you are going to eat meat, eat grass fed, hormone/antibiotic free meats. That goes double for vegetables. How are the poor supposed to be vegan/vegetarian? They can't afford to buy organic fruits and vegetables. I would hate to see what a low budget vegan diet looks like. The problem is processed foods, not whether or not it's plant or meat. Get a clue, people. Can we be clear that this cohort study should be considered almost scientifically useless? There's a moderate to weak correlation between vegetarians and poorer mental health. For a cohort study to be relevant it needs to show a massive association such as 50%+ increase of risk for a certain ailment which is typically not prevalent in a population ((IE smoking and small cell lung cancer) otherwise it can't be differentiated from selection bias. Personally I'm not a vegetarian. I'll consume almost anything, except bad science. From the budget perspective eating a grass fed butter+pastured eggs+grass-fed organ meats+ some veggies is more affordable than eating a lot of organic fruits and vegetables while low fat mostly because low fat food is less satiating on a long run - you will eat more often. I know - I tried both approaches. Emily, has any research been done on the diet likely to promote "shady Rock and Roll activities"? I'm thinking burger and fries, too much coffee and chocolate plus beer, but I'm open to any correlates you might bring to the table. So in what way does Jimmy Moore's 85-90% fat diet (to use the "face of low carb" as an example) constitute a healthy diet? To say nothing of it being one that any known civilization in history has ever consumed... Why is the larger Paleosphere still afraid to take on this guy? 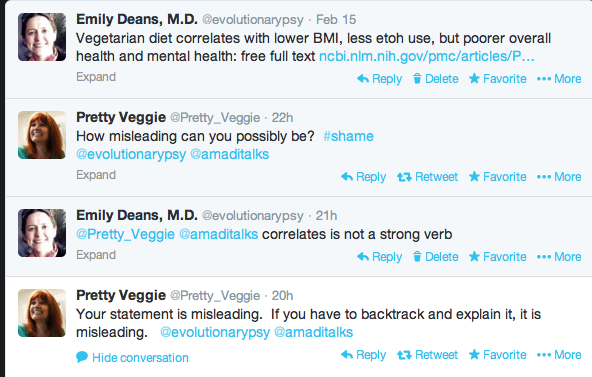 You should have asked Pretty Veggie to look up the definition of "correlates" and then reply. Her not understanding the meaning of the word does not mean you are being misleading.